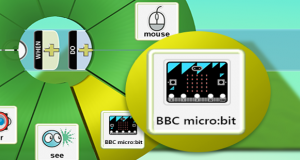 Along with many other Computing teachers I’m starting to get quite excited about the upcoming BBC Micro:Bit, this is basically a miniature computer which children will be able to program using either a block-based (Blockly) or textual programming language (Touch Develop and hopefully Python too!). Once the program has been transferred to the device it can be unplugged from the computer and will then run the program independently. These devices are being given to ALL year 7 pupils across the UK as part of the BBC’s Make It Digital campaign and I must stress they are being given to the children not the school. The idea behind the device is that the children keep them, take them home and use them independently for creating cool projects! I think this is great and am really keen for my students to have a new toy to play with and investigate and I’m hoping this will give them more confidence in the subject to simply experiment and see what happens in the comfort of their own homes! I’ve seen a few mutterings from concerned teachers around the BBC’s method of distribution; wondering how they can use it in lessons and worrying about making last-minute changes to their schemes of work, especially as the children are taking them home and (probably) not remembering to bring them back! My answer is don’t, there is no need to adjust your curriculum plans, no need to change everything once again. Don’t view these devices as a hindrance or “another thing to think about” but instead view them as an opportunity to put technology in the hands of children who would not normally have access to such gadgets at home. Give them to your pupils and see what they produce! 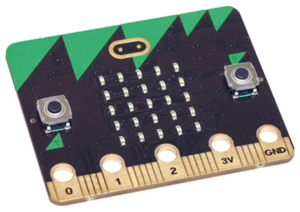 Although I’m not planning to embed the Micro:Bit into our lessons, one thing I am interested in is the integration with Kodu. By coincidence (or luck) our year 7s will be working on their Kodu unit at the time they should be receiving their Micro:Bits. I’ve been reading that they can use the built-in accelerometer and hardware buttons as methods for controlling characters so there is an opportunity for them to use these within their Kodu games if they wish. You can read about this further on the Kodu Game Lab website. So what’s our launch plan? In my school we intend to make a big deal out of these new devices. My aim is to invite our year 7s into school with their parents for an evening of workshops to give them ideas of how they they can be used. We will also use this evening to launch our Micro:Bit competition, challenging students to come up with the most innovative and interesting uses possible, document their project (in any way they choose) and submit these for us to judge. I’m also planning to introduce a Digital Leaders scheme for year 9 next year so will probably get those on-board with the judging. The plan will be to produce an exhibition or series of displays showcasing the students’ work, making them as high profile as possible. At the end of the evening each student will, of course, leave with their brand new Micro:Bit along with ideas on how it can be used! Any students who do not attend will be given theirs’ within Computing lessons when we will, again, emphasise and promote the competition. In addition to this I have some plans brewing for Europe Code Week in October so I have my fingers crossed the Micro:Bit launch will tie-in with this but that will be in the hands of the BBC who have not released any formal information about when the devices will be passed to schools exactly (although I have heard rumours of it being October). If you’re interested in learning more or would like to get a head-start in reading up on how it works you can read a preview of the Teacher’s Guide over on Hodder Education’s website. If your school has not received an email from the BBC, you can register for the devices here. How will you be launching yours? I’d love to hear your thoughts and suggestions in the comments below. One problem we encountered is that student areas really ran out of space very quickly because Kodu files are rather big. Did anyone else have this problem/find a work around? I’m not sure about your space issue. Are you sure it’s the Kodu files that are causing an issue? These should typically be very small. Mine are no bigger than a few hundred kb in size (even the exported files). Kodu usually just generates small XML files as all the assets are within the software itself and the XML files just point to these therefore no assets are stored as part of the file. Hope that made sense!